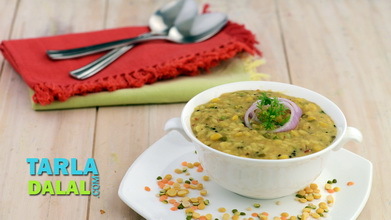 Masoor dal with spinach, the unbeatable combination of masoor dal with spinach nourishes your body with proteins, iron and folic acid. 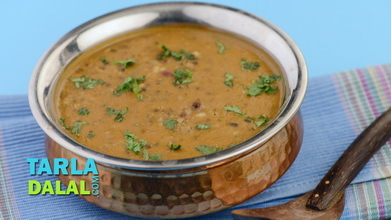 Tomatoes and amchur powder lend a nice tangy flavour to the dal. 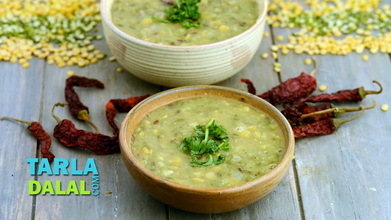 Needless to add, this is a super-healthy recipe as protein-rich dals are an indispensable part of our daily diet! 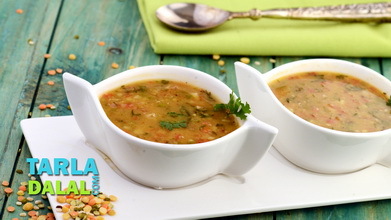 Pour 1½ cups of water in a pressure cooker, add the masoor dal, mix well and pressure cook for 2 whistles. 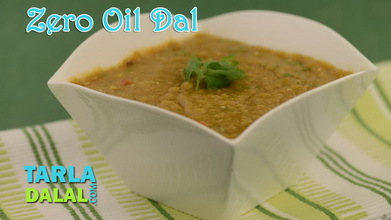 Heat the oil in a kadhai, add the cumin seeds, mix well and sauté on a medium flame for a few seconds. 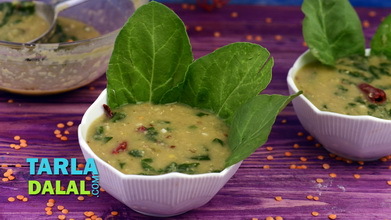 Add the cooked masoor dal, spinach, turmeric powder, dry mango powder, prepared garlic- ginger-green chilli paste, tomatoes and salt, mix well and cook on a medium flame for 2 to 3 minutes, while stirring occasionally. 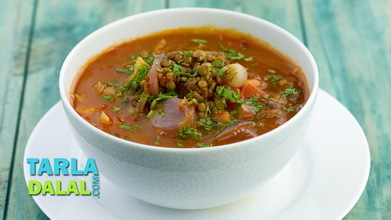 Add ¼ cup of water and chilli powder, mix well and cook on a medium flame for 3 to 4 minutes, while stirring occasionally. such an easy recipe!! 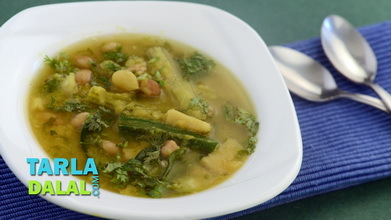 Delightful taste and healthy too. Tarla Dalal ji''s video presentation is so easy to follow. Thank you!